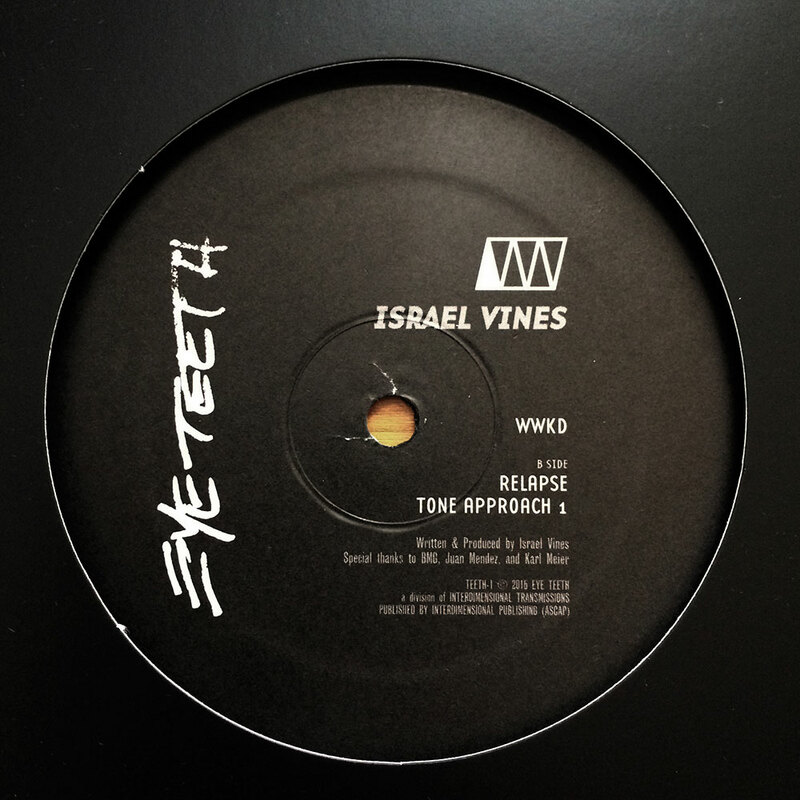 Eye Teeth, the new techno sublabel of Interdimensional Transmissions, launches with an EP from Israel Vines. We started this sublabel as way of exploring pure and experimental techno in an entirely contemporary context (where IT often uses historical lenses and a wider musical context). This is Techno from Detroit and America, not Detroit Techno. We would like to see American Techno evolve, and this new imprint is an attempt to be a catalyst in that arena. We launch this label with what we consider to be an anthem, “WWKD.” This is a special sound system Techno and Bass hybrid that works in many contexts. It has the funk but is black leather tough. The B Side features some Deep Techno and Ambient tone exploration. We will follow this EP with another EP from Israel featuring new material alongside remixes from Silent Servant and BMG. This EP was mixed with the help of Juan Mendez. Israel Vines is from literally everywhere, having spent formative rave years in Detroit, working at Gramaphone in Chicago, and now living and working in Los Angeles. He first made an impact with his label Borrowed Language, doing a number of split EPs and collaborations with Jeff Pietro, where the two created a strange combination of thunderous Birmingham Techno and modern Bass Music. Vines has also released on Cult Figures and Semantica with upcoming work on Horizon- tal Ground, while providing remixes for Erika, Makaton, and Stave. In addition to his expansive DJ sets, he is currently collaborating with Chicago artist Kit Geary as KGIV.